This one-story brick building in Lake City was built in 1913 as a passenger and freight depot. Tracks were first laid in Lake City in 1856 by the Northeastern Railroad, boosting commerce in this prolific farming town. 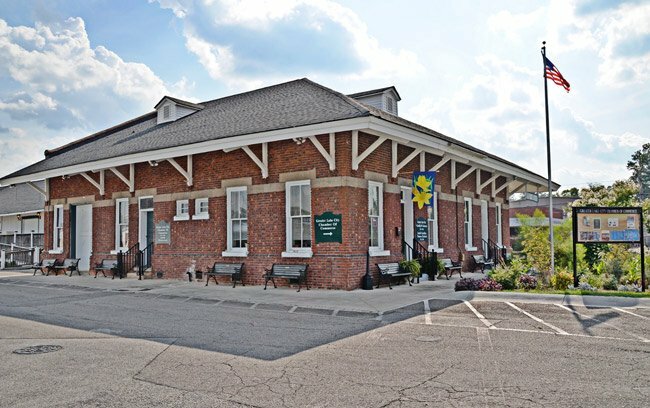 By the early twentieth century, the Atlantic Coast Line Railroad owned and operated the tracks, adding this depot. Lake City was a busy stop along the railroad, transporting produce and tobacco grown in the Pee Dee town to markets far and wide. In the early twentieth century, the agricultural community of Lake City was said to grow the most diverse crops in both of the Carolinas combined. When the Bean Market was built in 1936, it was the largest green bean auction center in the world. Though the depot no longer serves passengers or carries freight, guests continue to watch trains roll by from the Railway Restaurant, which sits behind the brick building. Twenty-five trains now pass through Lake City on the historic tracks currently owned and operated by CSX Railroad. Today the city’s business community meets in the former depot, which now serves as offices for the Lake City Chamber of Commerce.